contact requests I am getting via MyBlogLog is going up every day. Well maybe Eric read that. Or maybe not. But he wrote a post on the MyBlogLog blog yesterday outlining exactly how fast MyBlogLog is taking off. Here’s my favorite chart. This shows the number of reader rolls served every day. I like this chart for a couple reasons. First because it shows how fast MyBlogLog is growing. 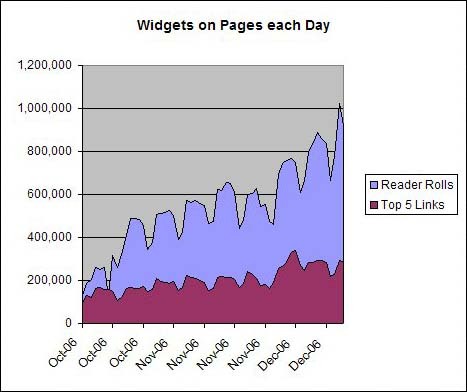 But it also shows how widgets can be used to build a real web presence quickly. If the widget was an ad, it would be getting a million impressions a day. At the rate that costs on my blog (about $10 cpm) that would cost $300,000 per month. So that’s a very valuable attention gathering strategy. In the case of MyBlogLog, I don’t know how the service could work without the reader roll widget. It’s the front door and the reason the service is popular. So going from basically zero impressions in at the start of the fourth quarter to over 1 million this week is a great accomplishment. Congrats guys.